A man convinced of the inestimable worth of each human being, Frédéric served the poor of Paris well and drew others into serving the poor of the world. Through the St. Vincent de Paul Society, his work continues to the present day. 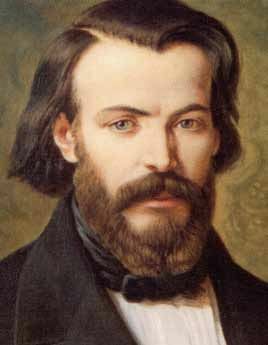 Frédéric was the fifth of Jean and Marie Ozanam’s 14 children, one of only three to reach adulthood. As a teenager he began having doubts about his religion. Reading and prayer did not seem to help, but long walking discussions with Father Noirot of the Lyons College clarified matters a great deal. Frédéric wanted to study literature, although his father, a doctor, wanted him to become a lawyer. Frédéric yielded to his father’s wishes and in 1831 arrived in Paris to study law at the University of the Sorbonne. When certain professors there mocked Catholic teachings in their lectures, Frédéric defended the Church. A discussion club which Frédéric organized sparked the turning point in his life. In this club Catholics, atheists and agnostics debated the issues of the day. Once, after Frédéric spoke about Christianity’s role in civilization, a club member said: "Let us be frank, Mr. Ozanam; let us also be very particular. What do you do besides talk to prove the faith you claim is in you?" Frédéric was stung by the question. He soon decided that his words needed a grounding in action. He and a friend began visiting Paris tenements and offering assistance as best they could. Soon a group dedicated to helping individuals in need under the patronage of St. Vincent de Paul formed around Frédéric. Feeling that the Catholic faith needed an excellent speaker to explain its teachings, Frédéric convinced the Archbishop of Paris to appoint Father Lacordaire, the greatest preacher then in France, to preach a Lenten series in Notre Dame Cathedral. It was well attended and became an annual tradition in Paris. After Frédéric earned his law degree at the Sorbonne, he taught law at the University of Lyons. He also earned a doctorate in literature. Soon after marrying Amelie Soulacroix on June 23, 1841, he returned to the Sorbonne to teach literature. A well-respected lecturer, Frédéric worked to bring out the best in each student. Meanwhile, the St. Vincent de Paul Society was growing throughout Europe. Paris alone counted 25 conferences. In 1846, Frédéric, Amelie and their daughter Marie went to Italy; there he hoped to restore his poor health. They returned the next year. The revolution of 1848 left many Parisians in need of the services of the St. Vincent de Paul conferences. The unemployed numbered 275,000. The government asked Frédéric and his co-workers to supervise the government aid to the poor. Vincentians throughout Europe came to the aid of Paris. In 1852 poor health again forced Frédéric to return to Italy with his wife and daughter. He died on September 8, 1853. In his sermon at Frédéric’s funeral, Lacordaire described his friend as "one of those privileged creatures who came direct from the hand of God in whom God joins tenderness to genius in order to enkindle the world." Frédéric was beatified in 1997. He always respected poor while offering whatever service he could. Each man, woman and child was too precious for that. Serving the poor taught Frédéric something about God that he could not have learned elsewhere.